Does Your House Contain Toxic Construction Materials From China? 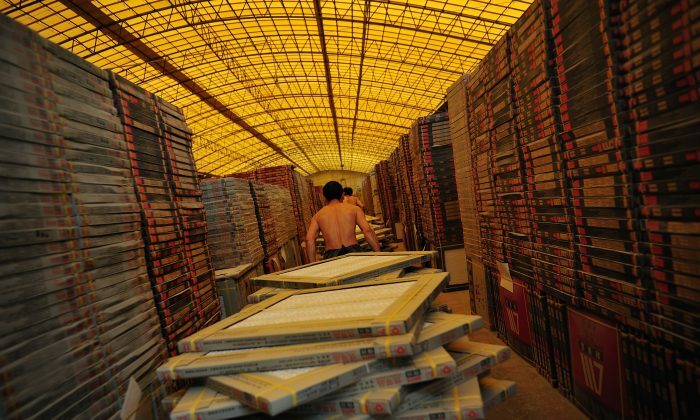 A worker drags tiles in a tile factory in Foshan of Guangdong Province on Sept. 26, 2008. Construction materials from China have been found to be hazardous. (China Photos/Getty Images). From pet food that kills pets to toxic toys that need to be recalled, Americans are all too familiar with problematic consumer imports from China. But construction materials—beyond the most well-known case of drywall—are no exception. According to statistics by China’s National Interior Decoration Association, 111,000 people in China die annually due to polluted air within the house, known as “decoration pollution.” That’s about 304 people per day, reported the state media China News in September 2014. The story of a 4-year-old girl diagnosed with leukemia grabbed headlines in 2013 after it was revealed that the air in her home in Changsha, Henan Province, was filled with toxic chemicals like formaldehyde and benzene, eight years after the renovation was done. In 2014 her father, Mr. Jiang, also came down with leukemia, reports say. Here are four construction materials made in China that it would be wise to stay away from. About 1,400 companies in China are licenced to produce water resistant adhesive, while another 500 manufacture it without a license. According to Zepol, which provides import and export data from U.S. Customs and Census, the United States imported $1.16 million worth of adhesives from China in November 2015, the fourth highest on the list. Most of the water-resistant adhesives are polyurethane-based and are often made by dissolving asphalt with toxic solvents. Any leftover solvent, as a result of poor production processes, can potentially leach into the air, even if covered with cement and tiles. In 2012, 60 percent of ceramic tiles used in the U.S. were imports. By square footage, China trailed only Mexico as the largest tile export nation, according to statistics by the Chinese website floordaily.net, which carries detailed information about the industry. Ms. Sun, a resident in Nanjing, Jiangsu Province, complained of dryness in her eye whenever she stayed at home for very long. She called for an inspection and it was discovered that her marble tiles were radioactive, according to a report published in Sina in October 2012. Tiles can become radioactive when manufacturers intentionally add zirconium oxide as a whitening agent, which makes them shinier and thus more popular with consumers. The addition of zirconium(IV) silicate, an emulsifying agent used during the glazing process, can also make tiles toxic. Matte-finished tiles are absent these concerns. Deng Minghe, a popular child actor in China, died from leukemia in April 2015 at the age of 8. It was later determined that paint used for in the renovation of his home was the cause, according to Chinese media reports. The presence of toxic organic solvents and lead within paints is extremely harmful for children because of their lower immunity. In addition to leukemia, joint pain, anemia, memory loss, and deterioration of cognitive function, are common problems associated with pollution from tainted paint. Experts suggest buying water-based paints to avoid coming into contact with toxic organic solvents. Drywall imported from China during the construction boom in the United States between about 2004 and 2007 is well known. Homeowners who used Chinese drywall quickly began complaining of bad smells, and attendant asthma attacks, chronic coughing, difficulty breathing, and chronic headaches, among other maladies. After damaging 60,000 to 100,000 homes number of homes and causing losses of 15 to 25 billion, a large number of class action lawsuits were launched. Some of them are still making their way through the legal system. Sulfur emission was the cause behind the different health problems. One possible explanation to this problem had been attributed to the use of fly ash, which breaks down in the presence of heat and moisture (such as in Florida and the American south). Even though the United States also uses fly ash in drywall, the manufacturing process is more robust and create a sturdier and cleaner final product. In the international race to gather foreign intelligence, China trumps all through sheer numbers, recruiting mass amounts of spies to infiltrate all sectors of society. Following numerous food scandals in China, many victimized Chinese have turned to organics as a safer alternative. But is China's "organic" actually safe?